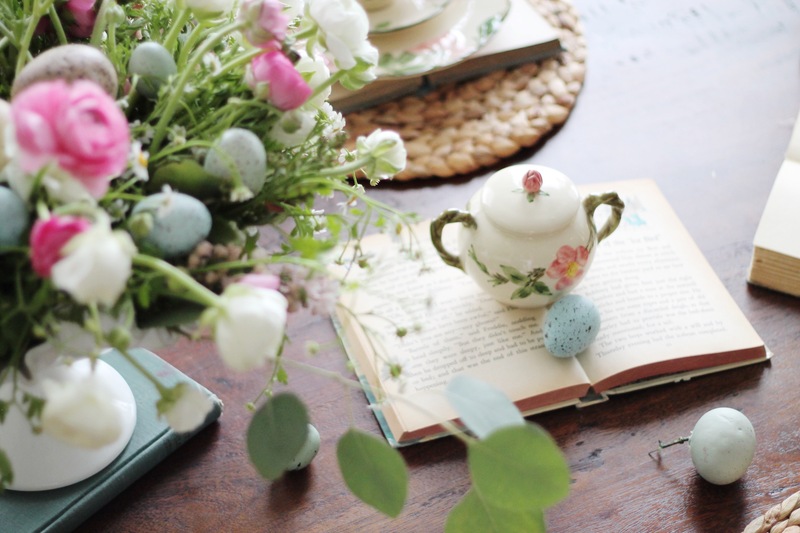 With Easter less than a week away we thought we would share some ideas for an Easter table scape. 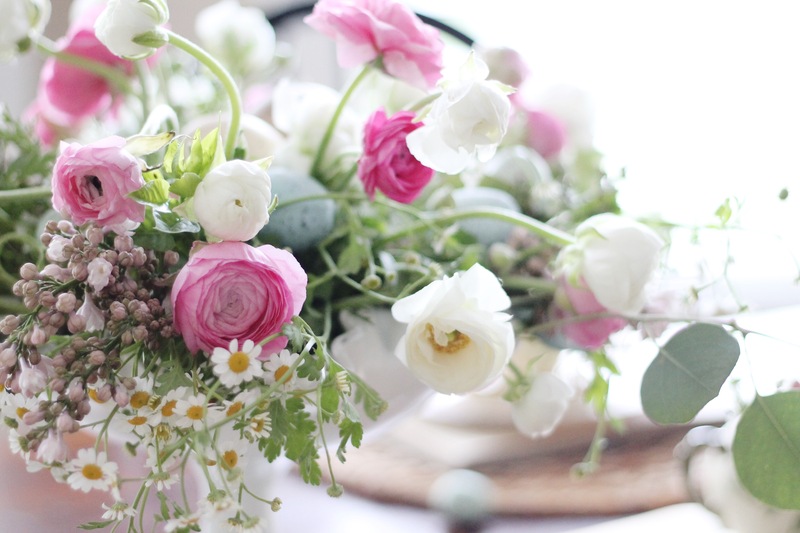 The inspiration for this table started with the flowers. We found some beautiful ranunculus at Trader Joes and knew we had to do some kind of flower arrangement for Easter with them. We snagged the ranunculus, lilac, some little wild flowers, and some eucalyptus. We are no flower arrangers by any means. We started by filling this flat vase with water and added flowers randomly in. Once it was pretty full we were able to squeeze some of the flowers in so they were standing more upright. We played around with the flowers for awhile until they were the way that we liked them. To add an Easter touch we placed some cute easter eggs. The flower arrangement turned out just like we envisioned. Now we had our centerpiece completed we just had to figure out the rest of the table. My mom remembered she has some antique dishes that matched the flowers perfectly. She pulled those out and we arranged the table from there. We used our usual placemats that were found at Pottery Barn and placed an open vintage book on top of the placemats. We have seen so many cute table scapes out there with vintage books as placemats and we knew they would go perfectly with our vintage dishes. We then placed the antique dishes on top of the placemats. They all came together perfectly. We placed more open vintage books down center of the table to act like a table runner. We then placed our serving dishes on them. The very last thing we added to the table were the little easter eggs that were spread out throughout the table. You could even write someones name on one of the eggs and place it on their plate so the guests know where their seat is. Now that we have our Easter table all ready and planned we need to plan what we are going to eat! Of course there will be ham but now we need to make the decisions on the sides. What are your favorite Easter side dishes to eat? 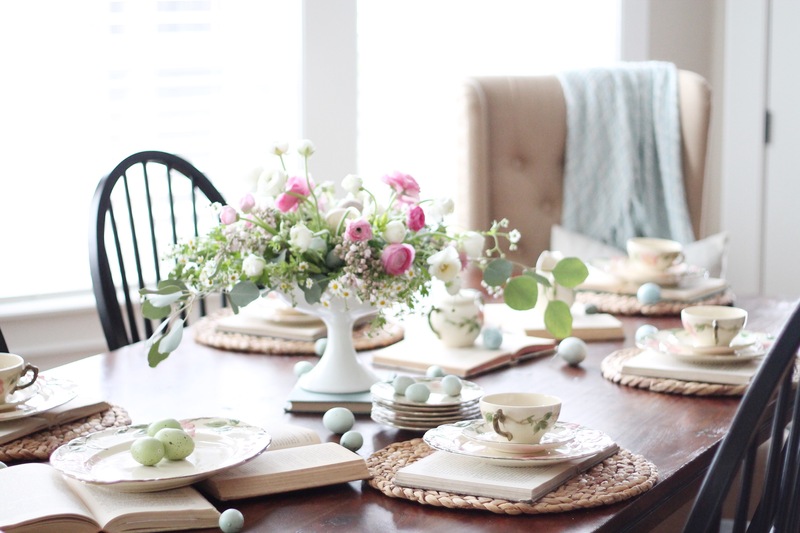 We hope you enjoyed our Easter themed table scape and hope it inspired you. Show us what your Easter table looks like next Sunday! We can’t wait to see. Happy Easter week! Beautiful table! I love the centerpiece!